The autumn is on the verge of ending and soon we will have a new season. It is yet another time of the year that brings yet another set of products. Wall Decals has introduced new wall stickers with completely new themes and colors. Welcome the new season by decorating the walls of your home with these amazing new wall stickers. There has been nothing amazing than dots on the wall. A wall sticker which gives you the complete independence to decorate the walls in terms of sticking the dots at any distance and at any part (top, bottom, middle, corner) of the wall. There are different sizes of these dots which gives the beauty of unevenness and adds more naturality to the design. These dot wall stickers come in 2 colors- gold and silver. With a little variation in the color (planetary body colors) you could decorate your kid’s room with a whole new universe inside. 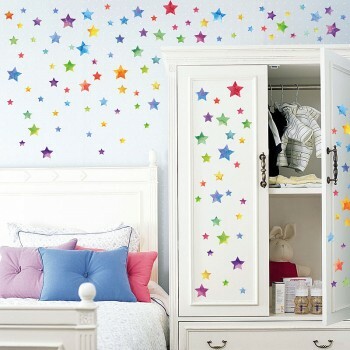 Exactly like the dots yet with a big difference is the Star wall stickers. Instead of dots you here have stars. 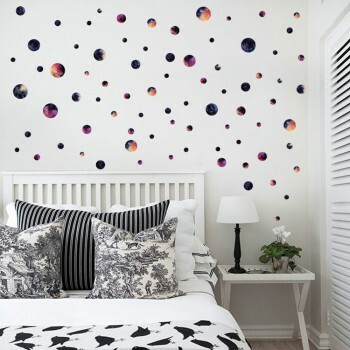 Stars of different sizes would actually make your kid’s room’s wall a beautiful sky. They come in silver and multi-color options. With a slight variation, you could get 3D stars that would surely add to the naturality. The 3D stars come with solid colors like red, green, purple, orange, blue etc., giving a multicolored look once put together. We have not had a 3D walls stickers like this. This time instead of simply putting an irregular 3D image, we have used a frame (which gives the overall picture a perfectly neat rectangular look). 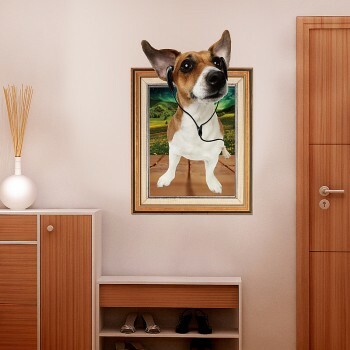 An image of a cute little dog with earphones plugged is standing inside the frame, but what gives the 3D effect is its head popping out of the frame. 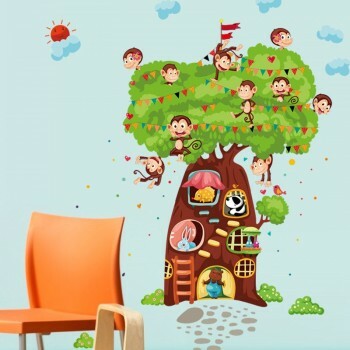 Yet another wall sticker for the kindergarten kids is this amazing wall sticker. A fat trunk tree that houses various animals in different tree holes would give your kid the importance of harmonious living. The top of the tree is bushy with a number of monkeys playing around. The sun and the clouds make the picture a holistic view. This is again a theme we have used for the first time to design a wall sticker. 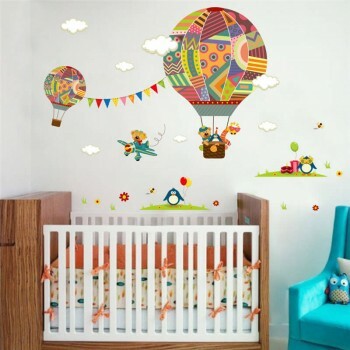 Similar to the animal-theme of the above wall stickers, this also has animals in it but not in a tree this time, rather in the hot air balloons, flying the single-engine aircrafts, penguins standing on the green patches of ground. The hot air balloons are colorful with varied designs on all the groves.